What do you think of when you think of Christmas? Is it a guy in a big red suit cramming himself into your chimney? Is it a wee bairn laying in a manger? Is it your Uncle Ole’s lutefisk that remains untouched on the platter for the 25th year in a row? Or is it windows and doors? It’s totally windows and doors, isn’t it? How are you going to gaze out upon the freshly fallen snow through old, drafty windows? Where are you going to hang your Christmas wreath if not on a nice, new steel door? However are you going to be blinded by your neighbor’s light display if not through brand new, high-efficiency windows? 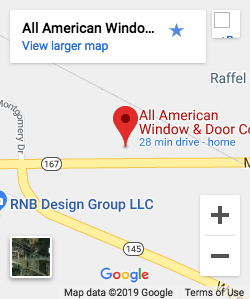 We here at All American Window and Door LOVE the holidays. Some of us, maybe, just a little too much as we tend to start singing Christmas tunes in the office about mid-June. And we want you to appreciate the holidays and all the binge eating, present unwrapping, and numerous other family traditions you can enjoy from the comfort of a home that knows how to keep the weather out and the Christmas spirit in. Call now to set up a free estimate. Our gift to you for Christmas. Then you can start looking forward to your brand new windows to hang the lights from NEXT Christmas. Just imagine how your tree will look standing next to one of our wonderful bay windows, or how your lights will look reflecting off the glass of one of our quad casements. Let our high efficiency windows put a little more presents money in your pocket over the next year and every year after. After all, ‘tis the season to think about windows and doors!